Mets general manager Brodie Van Wagenen has suggested he’s inclined to keep right-hander Noah Syndergaard, but some teams believe they’d “absolutely” deal him “for the right offer,” Buster Olney of ESPN writes (subscription required). The Syndergaard situation has been among the most interesting storylines of the young offseason, and it appears it’ll remain that way with the aggressive Van Wagenen set for his first Winter Meetings atop the Mets. With three arbitration-eligible seasons remaining, Syndergaard is one of the most valuable players in the game, which has led to heavy interest in the 26-year-old this winter but could also influence New York to go forward with him. The Dodgers look to be a driving force in the outfield market, Olney observes on Twitter. Not only could the Dodgers trade any of Yasiel Puig, Matt Kemp or Joc Pederson and pursue Bryce Harper, Olney notes, but he also connects them to free-agent center fielder A.J. Pollock. Needless to say, of Puig, Kemp and Pederson, the latter would warrant the highest return in a trade. The soon-to-be 27-year-old Pederson’s coming off the most effective season of the trio and is the only one controllable beyond 2019. Further, he’s projected to earn an eminently reasonable $4.7MM next year, his penultimate season of arbitration eligibility. The Dodgers are also “all in” on the catcher market, as are the Astros and Mets, Olney reports. Any of those teams could find its answer with Pittsburgh’s Francisco Cervelli, for whom the Pirates are willing to consider offers, according to Olney. Cervelli is coming off an impressive 2018, but as a soon-to-be 33-year-old who’s expensive ($11.5MM), down to his last season of team control and has a startling history of concussions, the low-budget Pirates may be willing to go in another direction. Back to the Astros, who didn’t earnestly pursue righty Nathan Eovaldi in free agency, Olney relays. The two sides were a match on paper, Olney points out, as Eovaldi’s a Houston native and the Astros are seeking starting help. Eovaldi re-signed with the Red Sox this week on a four-year, $68MM deal, though, and the Astros continue to need a starter. There’s “one industry theory” that the Astros are more focused on upgrading via trade, which could point them to Syndergaard, Corey Kluber, Trevor Bauer or Zack Greinke, Olney notes. After the season, when Olney reported the Indians planned to consider offers for their front-line starters (Kluber, Bauer and Carlos Carrasco), the Tribe didn’t expect to extend any of those three, Olney writes. However, the Indians re-upped Carrasco this week, in part because the 31-year-old made it clear he didn’t want to leave. Carrasco’s agents got to work on an extension with Cleveland shortly after questions about the futures of the team’s premier starters began swirling, and the two sides ultimately hammered out an agreement. Now, the Indians have “no interest” in trading Carrasco, Olney reports. The Indians have struck an extension with veteran righty Carlos Carrasco, announcing the deal just after Ken Rosenthal of The Athletic reported it (Twitter link). The ACES client will now be under contract in Cleveland through at least the 2022 campaign. In addition to his already-exercised 2019 option, Carrasco’s 2020 option will be picked up in advance. He’ll also receive an additional $27MM in guarantees, per Ryan Lewis of the Akron Beacon Journal (Twitter link). That comes in the form of consecutive $12MM salaries for 2021 and 2022 along with a $3MM buyout on a 2023 vesting/club option that is valued at $14MM. In total, then, the Indians owe Carrasco $44MM in salary for his next four seasons. That’s an incredible bargain for a pitcher who has unquestionably been one of the game’s best, even if he’ll likely move past his prime years during the duration of the agreement. Of course, the Indians have already achieved enormous value through their original long-term deal with Carrasco, who has been a steady top-of-the-rotation pitcher since signing it. In 722 innings over the past four seasons, he has worked to a 3.40 ERA with a shiny combination of 10.3 K/9 and 2.1 BB/9. Doubling down on Carrasco represents a notable decision for a club that is reputedly dangling some of its top starters in trade talks. He’ll now presumably stick around for the time being, leaving less certainty surrounding Corey Kluber and Trevor Bauer. Both figure to continue to draw plenty of attention on the trade market. There’s obviously some risk for the Indians in today’s move, as Carrasco will turn 32 before the 2019 season. It would not have been surprising had the team preferred instead to allow him to finish out his remaining two seasons of club control before deciding whether to commit further. Of course, the contract could well deliver ample cost savings as against the veteran hurler’s on-field value. Carrasco’s velocity is down from his peak, but he also just finished a campaign in which he posted a career-best 15.3% swinging-strike rate. On the player’s side, Carrasco has clearly continued to prioritize financial security over chasing open-market upside, as he did in his first deal. He was not operating from a position of strength in these talks given the preexisting contract structure, which he agreed to at a much less-certain stage of his career. Extensions have represented a critical component of the Indians’ roster management strategy in recent years. The team has achieved incredible value in deals with Kluber and Jose Ramirez, though the contract with Jason Kipnis has not aged as well. Cleveland has also reportedly tried to entice star shortstop Francisco Lindor, to no avail. As the Mariners continue to explore further ways to get younger and shed payroll, Ken Rosenthal of The Athletic reports that the team won’t be attaching Kyle Seager’s contract to Mitch Haniger in an effort to escape the remaining three years and $56MM on Seager’s seven-year deal (subscription required). First and foremost, the Seattle organization considers Haniger to be among the five best corner outfielders in baseball, Rosenthal notes. Beyond that, however, Seager’s contract contains a clause converting a $15MM club option for the 2022 season into a player option, should he be traded. Because that clause makes the remainder of the contract so unappealing to trade partners, he may very well need to rebuild some value in 2019 before he can be flipped. Rosenthal’s column also sheds some light on the Mariners’ other discussions on Robinson Cano and Edwin Diaz, in addition to highlighting the organization’s affinity for newly acquired prospect Jarred Kelenic. The Padres and Brewers are among the teams still in contact with the Yankees about a potential Sonny Gray swap, per Jon Morosi of MLB.com (Twitter links). Both organizations have been tied to various starting pitching options, though the Padres are a particularly curious fit, given their focus on the 2020 season and Gray’s status as a one-year rental. However, as Morosi’s colleague, AJ Cassavell, explains in greater detail, San Diego’s interest has some logic to it. Gray’s stock is down, and a resurgence in San Diego (like many arms before him) could allow him to either be traded for a greater price next July or position him to receive a qualifying offer next offseason. Even if the acquisition doesn’t pan out, he wouldn’t put a huge dent into a deep San Diego farm system. As for the Brewers, they’ve already got a deep collection of right-handed starters, but perhaps they view Gray as a premium rebound candidate and/or feel that acquiring him could allow them to deal from the back end of their current collection of rotation candidates. ESPN’s Buster Olney tweets that the market for Indians starters Corey Kluber, Carlos Carrasco and Trevor Bauer could come more into focus now that Patrick Corbin is off the board. Notably, Olney suggests that Cleveland “might” ask that a trade partner take Jason Kipnis and the remaining money on his contract ($17MM), though obviously doing so would rather notably diminish the return that the Indians would receive for any of their top three starters. Still, that scenario would certainly hold appeal to deeper-pocketed suitors of the Indians’ starters — particularly those with a good deal of long-term payroll flexibility (e.g. the Phillies). The Rays were among the teams with interest in Mets right-hander Noah Syndergaard, per Marc Topkin of the Tampa Bay Times (Twitter link), although Mets GM Brodie Van Wagenen strongly downplayed the possibility of trading Syndergaard earlier today. That said, Tampa’s interest in “Thor” is nonetheless notable, as it points to an interest in adding a controllable arm if one can be found at a reasonable financial price point. Then again, as a high-end starter with a projected salary under $6MM and three years of team control remaining, Syndergaard is (or was) something of a rarity on the trade market. Speculatively speaking, perhaps either Michael Fulmer or Jon Gray could be viewed in that same light, but both right-handers are coming off poor seasons, making it tough for their respective organizations to sell low. As rumors fly regarding the possibility of the Indians dealing one of their outstanding starting pitchers, there’s an interesting new wrinkle. The club is discussing a new contract with Carlos Carrasco, per Ken Rosenthal of The Athletic (Twitter links). Details aren’t known, but the Indians obviously see an opportunity to achieve yet more value with Carrasco, a player who has contributed plenty to the organization over the years. He previously inked a four-year, $22MM pact that included two options and has worked out quite favorably for the club. Carrasco has turned in 722 innings of 3.40 ERA ball since putting pen to paper, with advanced metrics suggesting he has been even better than the results alone would indicate. That contract still has two years left to go; he’ll earn just $9.75MM in 2019, while the club also possesses a 2020 option priced at $9.5MM (with the potential to rise by up to $4MM based upon Cy Young Award-driven escalators). Given that Carrasco is already 31 years of age, he obviously is not working from the strongest position of leverage in talks. Given that he’s discussing another long-term deal with the club, though, it also seems fair to presume that he truly wishes to remain with the only organization he has pitched for at the MLB level. As this news confirms, but was already evident, the Indians aren’t in a full-blown selling stance. 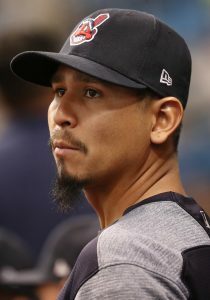 The club still profiles as a massive favorite in the American League Central and is no doubt hard at work thinking of ways to challenge the other top dogs in the AL. Rather, the Indians are trying to pull off a series of moves that will not only leave them in excellent shape for 2019, but will enhance their long-term sustainability. If a new deal comes together, Carrasco would obviously not be marketed this winter. That’d leave Corey Kluber and Trevor Bauer as potentially massive trade chips for the Indians to cash in for younger, controllable position players at an area of need. It’s not hard to see the appeal behind that concept, particularly given the still-impressive pitching depth in the organization. But doubling down on the existing investment in Carrasco is another intriguing avenue for achieving long-term value. The Indians’ top three starters have seen their names hit the rumor mill this winter, and MLB.com’s Jon Morosi writes that the Dodgers are among the teams who’ve discussed various trade concepts with Cleveland in the past few days. Specifically, one iteration involves both Corey Kluber and Yasiel Puig, per Morosi, though it’s clear that there are still some gaps to be filled in with regard to that specific package, as there’s no logical scenario in which Puig is any sort of centerpiece to a Kluber trade. In fact, while the Indians have obvious outfield needs, it’s difficult to see a player as expensive as Puig being a prime target to fill that need. The reported willingness to listen to offers on Kluber and others seemed to stem from a desire to create payroll flexibility and add controllable young talent. Puig checks neither of those boxes and is a clear downgrade from Kluber in terms of overall value. While Kluber will earn $17MM next season, Puig is projected by MLBTR contributor Matt Swartz to earn $11.3MM himself. Shedding a mere $6MM or so in payroll wouldn’t be of that much benefit to Cleveland unless the Dodgers were to add significant pre-arbitration talent and/or take on some additional money in return. Morosi writes that the Dodgers would likely be willing to part with lefty Alex Wood and pitching prospect Yadier Alvarez, but that pairing, again, presents issues. Namely, Wood is projected to earn $9MM in arbitration and, like Puig, is a free agent next winter. He’d be a fine one-year replacement for Kluber, but it’s the idea of moving Kluber to acquire a pair of expensive veterans who have just one season of team control remaining isn’t logical on its surface, unless there are other moving parts at play. Alvarez, meanwhile, was touted as a mega-prospect when he signed for $16MM out of Cuba (plus a matching $16MM luxury tax penalty), but he’s yet to top 100 innings in any of his three seasons in the Dodgers’ minor league ranks. Beyond that, the 2018 campaign was far and away his worst since signing; in 48 1/3 innings at the Double-A level, Alvarez posted a 4.66 ERA with 52 strikeouts against an alarming total of 43 walks. There’s still ample time for the 22-year-old to realize his potential, but he’s not the type of young player who’d headline a package for one of the game’s elite pitchers. The Dodgers do have the type of young talent that Cleveland would covet in any deal involving Kluber, of course, and it seems likely that any talks centering around him, Carlos Carrasco or Trevor Bauer have involved several names. But a deal including any of Puig, Wood or Alvarez would require the addition of some prominent young, controllable players in order to sufficiently pique Cleveland’s interest. Furthermore, it’s hard to envision a scenario where Cleveland adds the salary requirements that would come with both Puig and Wood in the same deal without some additional financial considerations coming into play. The Indians’ rotation has come up in trade rumors over the past month, as Cleveland looks to manage a roster with multiple holes and a crowded payroll that is already at franchise-record levels. However, while Corey Kluber and Carlos Carrasco have been speculative candidates to be moved, USA Today’s Bob Nightengale tweets that teams who’ve spoken to the Indians get the sense that Cleveland is more amenable to trading right-hander Trevor Bauer. Kluber is controlled through 2021, while Carrasco is locked into a club-friendly deal through the 2020 season. Bauer, though, is arbitration-eligible for another two seasons. MLBTR contributor Matt Swartz projects him to earn $11.6MM in 2019 — a projection he explored at greater length earlier today. If the Indians are to move a starter, there’s some sense behind making it the one of their “big three” who has the shortest amount of team control and least cost certainty, though there’s still no indication that the team is aggressively shopping any of its starters. The ask on Bauer would figure to be huge — likely including pre-arbitration, MLB-ready help — given Bauer’s 2.21 ERA, 11.3 K/9, 2.9 BB/9, 0.46 HR/9 and 44.5 percent grounder rate in 175 1/3 innings in 2018. Mike Moustakas is “on the radar” for the Cardinals as they look for a corner infield bat, tweets Fancred’s Jon Heyman. While Cards didn’t show much in the way of interest last winter, the absence of draft-pick compensation being attached to Moustakas is an important distinction that has them at least exploring the possibility this time around. Meanwhile, USA Today’s Bob Nightengale tweets that the Cards “made a competitive bid” for Josh Donaldson before the 32-year-old signed a one-year, $23MM contract with the Braves. There were similar reports about the Cardinals’ efforts to sign Jason Heyward and David Price, and the Cardinals also came up shy in their pursuit of Giancarlo Stanton last year when the slugger wouldn’t waive his no-trade protection to approve a deal to St. Louis. Of course, Moustakas is not likely to generate the level of market interest that those players did. There has been quite a lot of chatter regarding Mariners infielder Robinson Cano since it emerged recently that the club would like to find a way to dump his contract, though it’s far from evident whether there’s a particularly realistic match to be found. MLB.com’s Mark Feinsand says that some feel the M’s will find a taker, though he later added that Cano hasn’t yet been approached by the team about waiving his no-trade rights or about giving a list of destinations as to which he’d be amenable. (Twitter links.) One key factor in the Cano situation is the notion of the Mariners dealing star closer Edwin Diaz as a means of offloading the money owed Cano. There is indeed some willingness to do so on the part of the Seattle organization, per Joel Sherman of the New York Post. But it seems clubs with interest in Diaz aren’t necessarily amenable to taking on enough of the $120MM still owed to Cano to make it work. Sherman lists the Mets, Yankees, Braves, Phillies, and Red Sox as teams angling for Diaz, not all of which have any inclination to pick up Cano. That’s not surprising, as it’s an awfully steep dollar amount, even though the long-time star second baseman does still have value himself on the ballfield. That said, Diaz arguably could command something approaching that whopping sum in a hypothetical open-market scenario. After all, he stands out against any other potentially available relievers this winter for his excellence, age, and control. That makes this general structure at least somewhat plausible, though it’ll surely be quite complicated to pull something off. It seems the Mets have quite a few balls in the air at the moment as new GM Brodie Van Wagenen searches for a significant deal that will help jumpstart the franchise. Jon Heyman of Fancred (Twitter link) and Mike Puma of the New York Post (via Twitter) each doused the flames of speculation involving the Mets as a possible match in a Cano swap. But that doesn’t mean the team didn’t explore the subject with the Mariners. SNY.tv’s Andy Martino suggested some possible scenarios involving Cano, though really the basic framework does not seem workable from the Seattle side. Martino says the clubs have batted around a concept in which Seattle would both pay about $50MM of Cano’s salary and take on more in return, such as through Jay Bruce’s $26MM contract, while sending Diaz or Mitch Haniger to New York. Trouble is, the implication there is that the Mets could buy one of those excellent young players for less than $50MM, which doesn’t seem like sufficient salary relief for the Mariners to justify the loss of such core talent. Meanwhile, the biggest name seemingly in play on the Mets’ side is Noah Syndergaard, the uber-talented but health-questionable young righty. The Padres have made clear they won’t part with top prospect Fernando Tatis Jr., per Martino, which dovetails with expectations. While the report indicates that the teams have also discussed San Diego backstop Austin Hedges, he certainly does not profile as a centerpiece in a deal for Syndergaard. Meanwhile, Ken Rosenthal of The Athletic (subscription links) suggests the Rockies could be an under-the-radar suitor for Syndergaard, who’d turn their rotation into a potentially outstanding unit. Though the offense is surely the priority in Colorado, that can be addressed through relatively low-cost investments; adding Thor, meanwhile, is surely an intriguing thought. The Yankees and Mariners pulled off a blockbuster trade on Monday, when New York sent three prospects – including left-hander Justus Sheffield – to Seattle for southpaw James Paxton. But before that deal went down, there was a possibility of the Yankees returning Sheffield to the Indians, his first professional organization. Paul Hoynes of cleveland.com reports the Indians likely could have accepted a Sheffield-fronted package for any of Corey Kluber, Carlos Carrasco and Trevor Bauer, whom they’ve discussed with the Yankees. In the end, however, the two sides couldn’t match up, as Hoynes writes that the Mariners placed a higher value on Sheffield than the Indians did. According to Hoynes, Cleveland still likes Sheffield, whom it chose in the first round of the 2014 draft but later traded to the Yankees in a 2016 deal headlined by reliever Andrew Miller. Still, it’s no surprise that the Tribe elected against trading any of its ace-caliber starters to reunite with the 22-year-old Sheffield. If Cleveland’s going to move Kluber, Carrasco or Bauer, Hoynes relays that it’ll need to receive a return that would unquestionably help the club stay atop the American League Central, a division it has won three years in a row. Conversely, the Mariners don’t figure to contend in 2019, so they were more willing to accept a future-oriented package for Paxton. In addition to the well-regarded Sheffield, Paxton brought back a pair of non-elite prospects in righty Erik Swanson and outfielder Dom Thompson-Williams. Even if the Indians were to subtract one of Kluber, Carrasco or Bauer, starting pitching wouldn’t be a weak point for the club, as it also counts Mike Clevinger, Shane Bieber, Danny Salazar and Triston McKenzie among its rotation possibilities. The team’s outfield is an obvious concern, on the other hand, and as Kyle Downing of MLBTR pointed out in previewing the Indians’ offseason, it would make more sense for a Kluber, Carrasco or Bauer trade to net them a cheap, controllable solution in that area. If the Indians do part with any of their three right-handed stars this offseason, each would warrant a greater return than Paxton. The Big Maple, who’s down to his final two years of arbitration eligibility, hasn’t been as durable as any member of Cleveland’s trio. There’s also a rather strong case to be made that he simply isn’t as good as Kluber, Carrasco or Bauer. Few have been able to combine dominance and durability like the 32-year-old Kluber dating back to his 2014 breakout. The two-time AL Cy Young winner also comes with up to three years of team control. Kluber’s due $17MM next year, and after that, his employer will have decisions to make on a $17.5MM club option in 2020 and an $18MM option in ’21. Barring major injury issues or a noticeable downturn in performance, those options will be exercised. Like Paxton, both Carrasco and Bauer have two years of team control left. Carrasco will earn $9MM in 2019 and perhaps another $9.5MM by way of a club option in 2020, though that figure could increase based on AL Cy Young voting. Bauer’s future salaries are less certain than his two teammates’, but he’s projected to earn an affordable sum – $11.6MM – in his second-last year of arbitration eligibility. Although the 27-year-old doesn’t yet have the long-term track record of Kluber or Carrasco, Bauer may have been better than both of them in 2018, when he logged a 2.21 ERA/2.44 FIP with 11.34 K/9 and 2.93 BB/9 in 175 1/3 innings. It’s unclear whether the Indians will trade any of their three No. 1 starters in the coming months, but their futures will undoubtedly be among the majors’ most interesting storylines this offseason. Kluber, Carrasco and Bauer, along with Noah Syndergaard (Mets), Zack Greinke (Diamondbacks), Madison Bumgarner (Giants) and free agents Patrick Corbin and Dallas Keuchel, appear to be the best starters who have at least some chance to end up on the move prior to the 2019 campaign. With the GM Meetings now wrapped up, the stage is set for the offseason action to get underway. Of course, we’re still waiting for some significant dominoes to fall … and everyone involved is no doubt curious to see how this year’s market will develop after the 2017-18 dud. Jeff Passan of Yahoo Sports cites some warning signs on spending levels; readers interested in the higher-level picture will want to give his reasoning a look. Though the Yankees seem unsettled at first base, Jon Heyman of Fancred reports that they haven’t reached out to the Diamondbacks on slugger Paul Goldschmidt. The potential rental slugger, one of the game’s steadiest offensive producers, is reportedly on the trading block. While the Yankees got stunning production from Luke Voit over a brief stretch late last year, and still have Greg Bird on hand, it wouldn’t be surprising if they sought to add a bigger piece. Unsurprisingly, the Bronx organization seems fixated first on pitching. Beyond its free agent targets, the club is looking into the biggest possible names on the trade market. Ken Rosenthal of The Athletic tweets that the Yanks have opened a line of communication with the Mariners on James Paxton. And the New York delegation to the GM Meetings met with their peers from the Indians, per Jon Heyman of Fancred (via Twitter), with Corey Kluber and Carlos Carrasco both covered in conversation. It obviously isn’t at all surprising to hear that the Yankees have checked in on these distinguished hurlers, but it’s nevertheless a notable bit of information as the market continues to develop. There are quite a few possibilities for the Padres, writes Dennis Lin of The Athletic (subscription link), as the organization is feeling a need to show some real strides in the win-loss department. We’ve heard chatter recently about the desire for a young starter and the series of potential trade pieces, but Lin’s most interesting notes seem to focus on the left side of the infield. Manny Machado is not seen internally as a realistic target, with Freddy Galvis still under consideration at short. If the team really wants to push things forward, though, Galvis or another veteran may only warm the seat up for top prospect Fernando Tatis Jr. At third, Josh Donaldson does not appear to be the first name on the club’s list of targets. Rather, says Lin, the current plan is to seek a new third baseman via trade. So, where have the Padres set their sights for a third baseman? There aren’t many obviously available options that would figure to represent everyday pieces. Kevin Acee of the San Diego Union-Tribune reported recently, though, that the Pads are interested in pursuing Reds third baseman Eugenio Suarez, who recently posted a big campaign on the heels of what now looks to be quite a team-friendly extension. Given the Cincinnati organization’s inclination to begin pushing toward contention, that seems like a tough deal to swing for Padres GM A.J. Preller. Acee also tabs the Padres as a suitor for Yankees righty Sonny Gray, who’s being openly marketed. Whether Gray would be seen as fulfilling the club’s rotation needs, or rather serving as a potential complement to a more significant addition, isn’t clear. There are other teams with interest in Gray, of course. Per MLB.com’s Mark Feinsand, at least five organizations have inquired, and it wouldn’t be surprising to hear of more. Among those contemplating a move is Gray’s former employer. The Athletics evidently think their former staff ace could bounce back in Oakland, per Jon Heyman of Fancred. Of course, it remains to be seen how much the A’s will be willing to stake on a turnaround. Meanwhile, MLB.com’s Mark Feinsand hears that at least five teams have inquired with the Yankees on Gray’s availability — the A’s presumably among them. Gray is projected to top $9MM in arbitration earnings this winter, but he thrived away from Yankee Stadium last season and had plenty of encouraging secondary metrics beyond his rudimentary ERA. We’ve heard recently that the Cardinals intend to explore the relief market, with one southpaw on the team’s priority list. Accordingly, it’s no surprise to hear that the club is among the many teams to show early interest in veteran lefty Andrew Miller, as MLB.com’s Jon Morosi tweets. Miller is drawing interest after getting some good news on his knee, so there’ll be no shortage of competition. At this point, it’s entirely unclear where he’ll end up.